Rooted deep in Wisconsin’s forest fire control history, the Emergency Fire Warden (EFW) program is a long-standing partnership that has benefitted the State of Wisconsin since the turn of the century. While the role and number of EFWs has changed significantly over time, evolving from detection and suppression duties to the current role of mainly issuing burning permits, a few of those iconic ‘fire warden’ signs continue to hang on fence posts in small, rural communities throughout Wisconsin. Historically, emergency fire wardens played an important role in preventing, detecting and suppressing wildfires. Photo taken in 1955 near Park Falls, WI. Since 1885, Wisconsin’s emergency fire wardens have been on the front line of forest fire control, promoting fire prevention and helping to fight fires. Fire wardens were expected to post fire warnings, prohibit burning during dry months and report on fires. 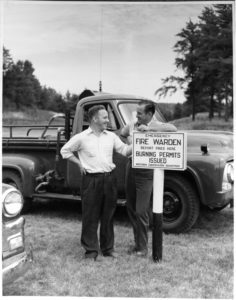 Fire wardens were often the first to report forest fires to the local fire departments and ranger stations. They also organized, hired and served on fire-fighting crews.